Once the machine is connected, make sure it is level and plug it in. Then, do a sample run and check carefully around the intake hoses and the drain line to make sure there aren’t any leaks. If the outside of the lines are dry, then you’re ready to start washing your clothes! If you do see any water seeping out where it shouldn’t, double check your connections. 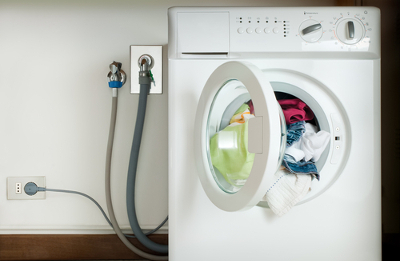 The most important factor when hooking up your new washing machine is to make sure the connection is done properly and will not cause leaks or other problems in the future. If you aren’t sure how to set up the plumbing yourself, get in touch with an experienced plumber who can help put you on the right path.